The first time I was smitten with bread making (my “dough odyssey” started early this winter), I didn’t want to go all out for baking gadgets because I was afraid it might be just another passing fancy. Baking one loaf alone takes about 3 to 4 hours so I wasn’t sure my new bread hobby would stick. 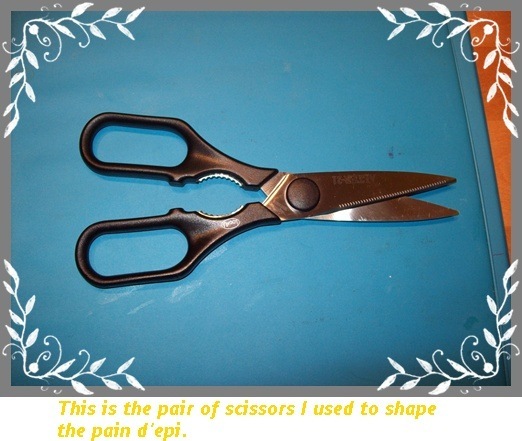 One of the first baking tools I spent money on was a good pair of baker’s scissors. The shape of the pain d’epi (wheat stalk bread), which requires the use of scissors, seemed like a challenge especially for a bread novice. The pair of scissors was rather expensive, but I thought it was a good idea to invest in good quality tools if I wanted to create acceptable bread shapes. Now my confession: the first picture you see isn’t a real pain d’epi. Pain d’epi, like the baguette, is a crust bread. 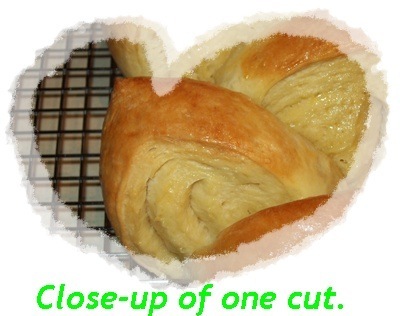 What I used to practice my “cutting skill” was a regular recipe for bread rolls. Like I said in an earlier blog, I have not yet ventured into crumbs, crusts, rye and sourdough. I like to make plain white loaves, rolls and sweet breads. I’m sure there’ll be another time for learning how to achieve excellent crust breads. 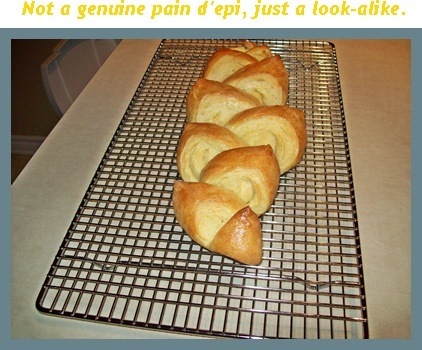 If you want to try a genuine pain d’epi recipe and want clear instructions on how to shape it, go to this link: http://www.artisanbreadinfive.com/?p=152. The owners of this web site wrote Artisan Bread in Five Minutes a Day which I enjoyed. Their pain d’epi looks a lot more attractive and authentic than mine does. You can certainly see the huge difference. Their pain is a lot thinner with a much better crust (and bite). If the prospect of spending 3-1/2 to 4 hours to make bread discourages you, I recommend Artisan Bread in Five Minutes a Day. It refutes some of the generally accepted methods of bread making with surprising results that prove the authors know what they’re talking about! In the link I provided, there is a step-by-step on the cutting procedure with crystal clear photographs. And, they have very good recipes for no-knead bread. Yes, no-knead!